Catholic News Service's Hanukkah Tweet Shows Ancient Jewish Temple's Destruction A relief showed Roman soldiers carrying the spoils of the war, including a menorah from the destroyed ancient Temple of Jerusalem. Observers noted the problematic image. 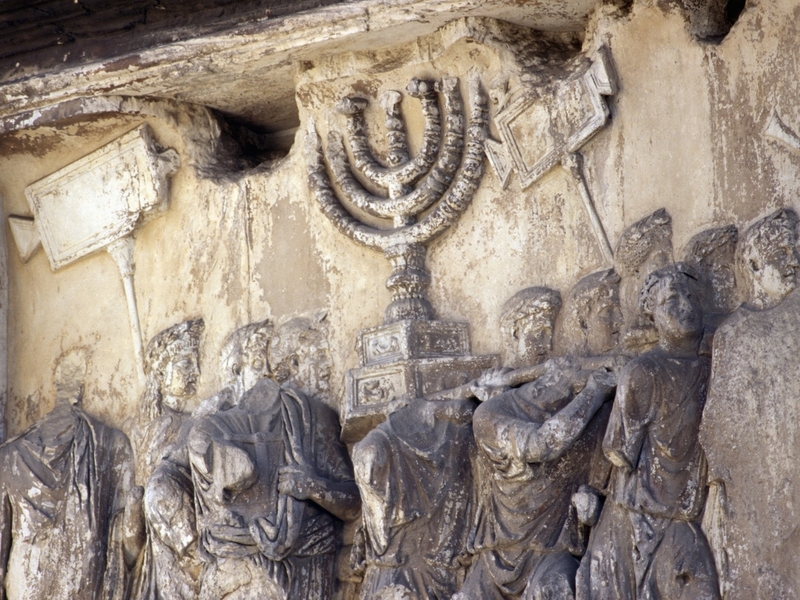 A relief under Rome's Arch of Titus, built in the first century, shows a menorah being taken away from the Temple in Jerusalem. Sometimes it's the most well-intended messages that go awry. Catholic News Service, a U.S. denominational news agency, posted a tweet on Sunday that said: "Hanukkah began at sundown. Happy Hanukkah to those who celebrate!" An accompanying photo showed a relief from the Arch of Titus, a marble structure built in Rome in the first century that commemorates "the victory of the Roman general, later emperor, Titus, in the Jewish War of 66-74 CE," according to a project at Yeshiva University. The relief shows Roman soldiers carrying the spoils of the war, including a seven-branched menorah from the destroyed Temple of Jerusalem. Hanukkah celebrates the rededication of the Temple in the second century B.C. and involves a nine-branched menorah. On Twitter, observers immediately noted the problematic choice of photo. "[B]asically after the Romans sacked Jerusalem and destroyed the Temple they carted off all the goods, brought it all back to Rome and held an epic rally in Rome to celebrate," wrote Josh Marshall, editor of political site Talking Points Memo. "That arch of titus is like a pictorial about the rally. So it's sort of not in a spirit of Happy Hanukkah." Another Twitter user wrote: "It's a very famous image, from the inside of the Arch of Titus in Rome. It [commemorates] the conquest of Jerusalem and the destruction of the Temple. Which is the opposite of what the Hannukah holiday is about :-)." According to Steven Fine, professor of Jewish history at Yeshiva University and director of the project there, the arch has long been highly symbolic. "For centuries the Jews in Rome would not walk under it, as they saw themselves as exiles from Jerusalem forcibly brought to Rome," he told The New York Times in 2012. "Then in the 19th century the arch became a marker of Jewish antiquity and pride, a symbol of exile and redemption that is so important to Jewish heritage." Catholic News Service deleted the tweet shortly after it was posted and sent two apology tweets. "Sunday we inadvertently posted an offensive photo. We were sloppy in our tweeting; people were right to be offended," the second apology said. "The person who posted the tweet now fully understands the implications of the picture. We apologize again."